Thank you for donating to the Unist’ot’en Camp. Your contribution ensures that supporters on the land have food and medical supplies, that Unist’ot’en Youth are able to visit their territories, that Wet’suwet’en Elders have the necessary materials on the land to teach traditional hunting, gathering, food processing, language skills, songs, stories and more. Your monetary contributions enable the Unist’ot’en Clan to stop the pipelines that threaten all of us. How to donate: Follow the instructions below to donate online. If you prefer, you may also mail a cheque – instructions are at the bottom of this page. All donations from these payment sites are secure and 100% of funds go directly to the camp hosts. Please note: DO NOT donate to online funds other than the official links on this page! 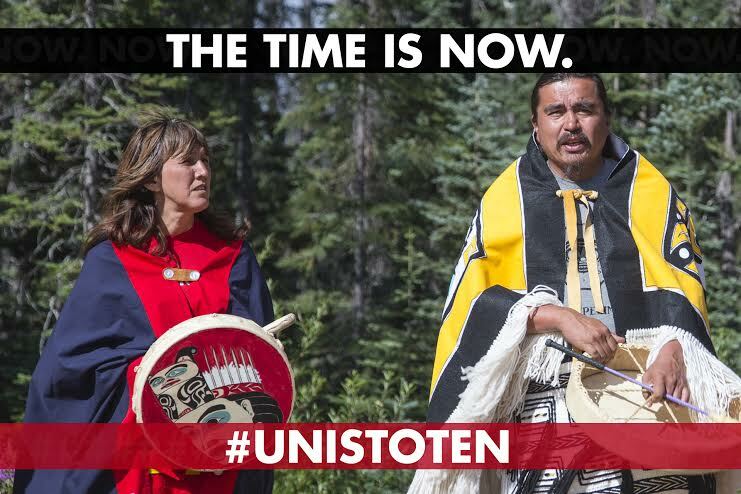 Click here to donate to the Unist’ot’en Camp Legal Fund. The Unist’ot’en and their allies will be facing mounting legal fees in order to protect the territory. Legal funds for the Unist’ot’en land defenders are absolutely crucial and a main priority at this time. Please note: This site uses CAD (Canadian currency). Your currency will be exchanged automatically. Click here to become an Unist’ot’en Camp Monthly Donor on Action Network. Click the yellow “Donate” button below to make a ONE-TIME donation through Paypal. Please note that this site uses USD (United States currency). Your currency will be exchanged automatically.